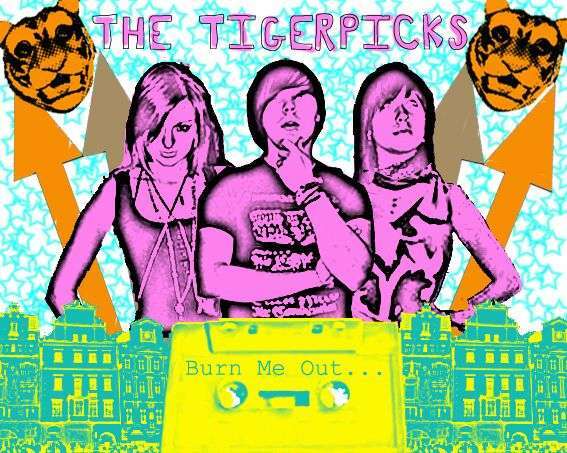 Before the Tigerpicks had even played their first ever gig this September they were already the most talked about band in Manchester. CDs of "Disco Punk Electro Punk" had swapped hands, MP3's forwarded on around DJs at clubs such as Poptastic and Club Clique who were keen to get hold of the track that was getting more requests than the Yeah Yeah Yeahs and The Gossip and before the door opened at Designer Magazine's In The City Preview show in September a queue was rapidly forming outside. Four weeks later and about 5 gigs later the band were signed to Deltasonic Records, home of the Coral and Zutons, in what must have been the fastest signing in history. Q: So, The Tigerpicks play their first gig at the end of September and are signed to Deltasonic by the end of October....pretty mad....how did it happen so quickly? A: You tell me. I think we're all still really caught up in it and haven't had time to kind of step back and think 'wow, this is so surreal'. We've got a rehearsal room at a place in Liverpool and the guy who owns them showed Deltasonic our stuff and they liked us so came to see us at a gig at Dry bar and then two days later at In The City we were signed. Q: It wasn't part of the grand masterplan then? Q: What was the best joke you heard before this one then? Q: ha ha....your first gig was at the Designer Magazine In The City Preview show in front of Andy Rourke from the Smiths and various Coronation Street cast members. How did that go for you? Q: How did the Picks get together and when exactly...rumours going everything from 2 months to a year? Q: The name...where's it from and what's this world of swurkeys and farm animals about? Q: Is a swurkey for life or just for christmas? Q: Back to the whole Deltasonic signing...an electro band and the Coral and Zutons? And have you shaken things up since you got there...you got them into a Tigerpicks state of mind? A: You need to shake things up a bit don't you? We'd like to think so. We've pissed all over them and made them our own territory and they love it. Or at least they pretend they do, but that's good enough. Q: And what's the plans for the first release on Deltasonic? When can we expect it? And is there a national tour support? Q: You played with the Little Flames last week as well in that rumoured secret Arctic Monkeys gig...your initiation into the fold? Q: 2 gigs in one night - doesn't that make you proper popstars now? Q: Which bands have you met so far out of the Deltasonic roster and are you looking forward to the massive Xmas bash at the Academy? Q: The Tigerpicks aren't what people would normally associate with Manchester though (Oasis, Roses, scallies)....how did you avoid the ghost of Manchester musically? A: We try not to categorize ourselves too much, leave it open. electro is the genre and i guess 'nu-rave' is a sub-genre of electro. if people wanna pigeon hole us at nu-rave, then fair enough, but we're not gonna pigeonhole ourselves. Yeah, I have nothing against the Klaxons. I quite like them in fact. There's an energy behind their stuff which isn't too common these days. That's why i love bands like Yeah Yeah Yeahs, Liars & Le Tigre, they're exciting and they put on an ace stage show. I wanna be entertained when i see a band perform. I saw Klaxons at Leeds Festival this summer and the atmosphere in the tent was unbelievable. Completely electric! Q: And the look - are you the one that decides you'll try and outdress Kylie then? Q: So where is your look from...that guy from Fast Food Rockers who's a go go dancer in Essentials (which i've never been to but saw his picture on FmForums)? Q: Do the girls get jealous of your outfits? Q: What response do you think you'd get if the Tigerpicks walked into an X Factor Audition instead of In The City? Q: I guess that leaves us with the question - would you allow Louis Walsh to join in? A: Ew no. I'd rather that Russian spy had a go!